A Slouch Hat is a wide-brimmed felt hat with a chinstrap usually worn as part of a military uniform. Slouch Hat refers to the fact that one side droops with the other pinned against the side of the crown. This style of hat has been worn for many hundreds of years, especially during the English Civil War when it became associated with the Cavaliers, the forces of King Charles I. The Slouch Hat was also fashionable for the aristocracy throughout Europe during that time until it was superseded by the tricorn. The Slouch Hat has been worn by military personnel from around the world – Australia, United Kingdom, India, New Zealand, Southern Rhodesia, France, the United States, Germany amongst others. Australia has had a slouch as the standard issue headwear from around 1885 and still does today. Today, it continues to be worn by military personnel from a number of countries, although it is primarily associated with Australia, where it is considered to be a national symbol. 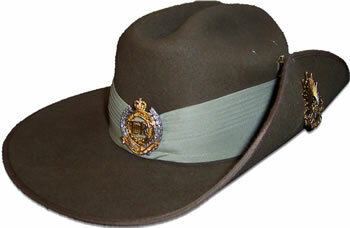 The distinctive Australian Slouch Hat, sometimes called an Australian bush hat, has one side of the brim turned up or pinned to the side of the hat with a special badge (the bayonet collection badge, or the rising sun badge) in order to allow a rifle to be slung over the shoulder. In the United States it was also called the Kossuth hat, after Lajos Kossuth.